When you sign up for any online service, you usually need to add an email address. If you usually use a Gmail account, Deseat.me can scour your email to find everything you signed up for and offer you ways to delete your account. Letting a third-party app read your emails is a scary proposition. That’s why Deseat.me uses Google OAuth to sign into Gmail, and then the app runs entirely on your computer. Your private data isn’t sent to the cloud, according to the developers. So here’s how it works. Sign in with Google, and give Deseat.me a few minutes to show you a list of all the accounts you have signed up for, where you provided your Gmail address. Sort this list into two: click “add to delete queue” or “keep” on any item, and go through the entire list. 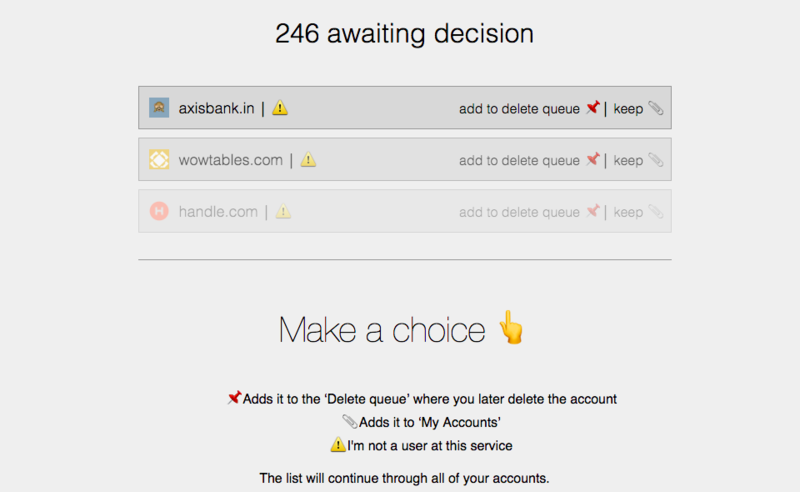 The “Delete Queue” list now serves as a reference for what you need to get rid of. For some popular services, you can click the “delete” button to directly go to the place where you can shut down your account. For others, you’ll need to go to the main site and delete it manually.